The 10Peaks™ Brecon Beacons courses visit a predetermined list of peaks in a set order in the Brecon Beacons, South Wales. The courses are unmarked so you will have to navigate yourself and be confident doing so day or night. Both the Short and Long Courses take in 10 of the best peaks, including a high percentage of the 10 highest peaks in the area. Both courses have a 24 hour cut-off. Easy! The Event Parking is at YHA Danywenallt. However, the parking is in an arable field, and vehicles that are low to the ground, or large motor homes (Camper Vans e.g. a VW Transporter would be ok) will not be able to access the parking. There is no alternative parking close to YHA Danywenallt. Please note: Your entry includes a finisher’s meal, available to you on your return. Pre-ordering to Danywenallt@yha.org.uk (subject: 10peaksfood) advisable to allow for proper planning of quantities and staff to ensure fast efficient service in preparation for a good night’s rest for all competitors and officials. Race map with route and checkpoints pre-marked. IMPORTANT: Participants can only register with photographic ID. The person at registration, the photographic ID and the online entry credentials must all match. Even if you think someone at registration will know you, you still require photographic ID. We are happy to accept a photocopy of your photographic ID if the photocopy is sufficiently high enough in quality that someone who doesn’t know you can identify you from it. A driving license, passport, or military ID are acceptable. A credit/debit card is NOT acceptable. We need to ensure that the person entered is the person standing in front of us at registration. 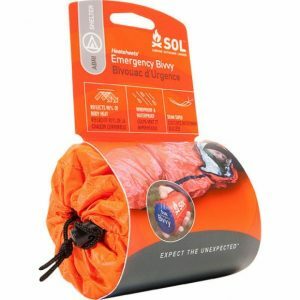 *Our recommended product for mandatory kit list item “survival bag” – starting at £15.29 for collection at registration – shop now. 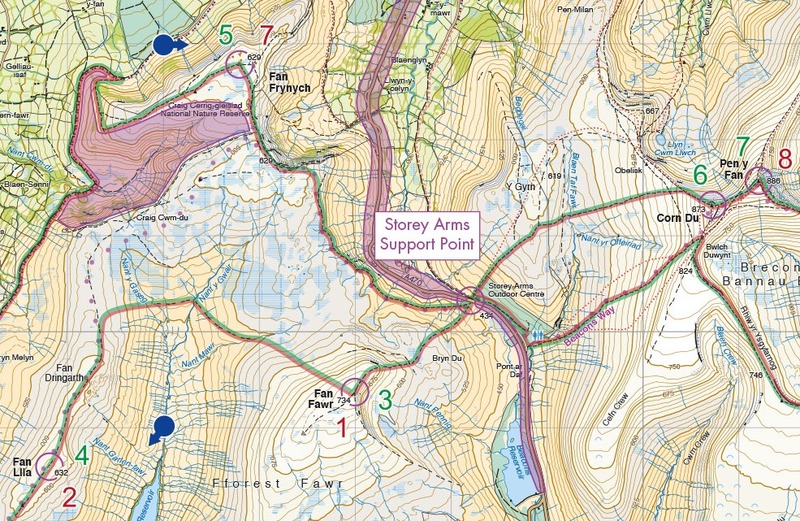 The long courses visit the Storey Arms Support Point twice; once on the way out, and a second time when returning. At each support point we will provide water (also hot where possible), fresh fruit, cake, sandwiches and both sweet & savoury snacks. You must ensure that you are carrying sufficient food and water supplies to be self-sufficient on the course in between the Support Points. There are opportunities to re-fill water from streams on the hill at your own discretion. Hot Soup and Drinks: At the Penwyllt and Storey Arms Support Points, we will also serve hot soup, tea and coffee. Drop Bag: All competitors will also have the option of leaving a small (3kg maximum weight), carefully labelled kit bag at registration for the organisers to forward to the Storey Arms Support Point, in which you can pack spare clothing and food etc. Bags will be returned to race HQ once all competitors have passed through. Please note that (especially short course) competitors may have a short wait after finishing for the drop bags to be returned to YHA Danywenallt. The map will be 1:40,000 scale as was successfully introduced last year. It is provided by Harvey Maps as in previous years. The 1:40,000 scale makes the map much more legible. Both the Short and Long Courses are marked on the map, as is the Bad Weather Route, and the Checkpoints and Support Points for each course. What to expect from your GPS Tracker? Trackers will be taped to the shoulder strap of your rucksack at registration, as far back as possible. They cannot be put in top pockets, or hip pockets. Trackers are left on until the end of the event. Do not try to turn the tracker off. Take care when picking up your rucksack so as not to grab the tracker and accidentally initiate the SOS button. The tracker only sends updates when it is moving. Please don’t use your rucksack as a pillow on Friday night – it will think it is moving as you stir in your sleep, and thus run the battery down! If for whatever reason you retire please do not under any circumstances leave the event without passing your tracker to event staff. This should only be pressed in an emergency when there is an immediate risk to life or a serious injury AND if you have failed to receive a response from Race Control. Follow the instructions on your race map to do this. The SOS Button sends a message with your location to the Race Control via the GSM network*. In an emergency, it is worth attempting an SOS button press even if no mobile phone signal is available (according to your own mobile phone). Due to a history of accidental presses, we will ignore SOS button presses from a GPS tracker which continues to move. You will not know if Race Control has successfully received an SOS alert. Please continue to consult the Emergency Protocol printed on the race map for further instructions. As we will be using a GPS tracking system for all competitors we will not have a sweeper on the courses. *The GPS trackers record their location via GPS but only send out their location via the GSM network (the same network that is used to support mobile phone coverage). As such, there are black spots along the route where there is no network coverage for the trackers. At these locations, the trackers record their location, buffering the data, and then send it out once back in network coverage. In these black spots, it is not possible to send an SOS message. In the event of an emergency please contact the Race Director in the first instance on the number printed on the map. It is often best to send a text message but please only assume this has been received if you receive a response back. Alternatively, phone 112 and ask for the Police and then Mountain Rescue. There will be limited transport from each Support Point to transport back to the Event Centre for those who are unable to continue. Please note that this is NOT a guaranteed service. Please note that we are unable to collect retiring participants from other locations on the course; you will need to organise your own transport back to the Event Centre if you abandon the race at any other location. Crucially, we must receive your SI dibber and GPS tracker back at the Event Centre before you leave. You will be given your race numbers at registration and these must be pinned to your vest/t-shirt (larger number) and rucksack (smaller number) so that it is visible at all times. You won’t be able to get any water or food without one. Race Numbers must not be folded. Competitors are asked to assist another competitor that is in distress. The assisting competitor will be credited for time lost. All competitors are required to carry a mobile phone. In the event of getting lost or injured, where there is no assistance on hand, use your phone to contact race HQ where you will receive advice on what to do. If you are in a life threatening emergency dial 999. If you are lost (and all attempts to confirm your whereabouts have failed) and you have no mobile phone reception, head downhill, following a track, stream or road until you have phone reception or obtain outside assistance. Inform race HQ as soon as possible. Race HQ will attempt to monitor all competitors’ whereabouts by GPS tracking and regular contact with checkpoints on the course. Missing competitors will be searched for, so to avoid unnecessary work for emergency services, please contact race HQ as soon as you have realised that you have made a big navigation error that will result in you falling behind on schedule. Please give all marshals the respect that they deserve. They are all volunteers and without them the race could not go ahead. Marshals will have been issued instructions on what to do in certain events. Please adhere to their requests at all times. Please get in touch if you wish to volunteer in 2018. The Short and Long Course are open to solo competitors only. However, we encourage competitors to join up with others, especially for the night sections and during bad weather. Results will have full age category listing. There will be prizes for the first 3 male and first 3 female finishers of both the long and short courses. This is a navigational event and all competitors must be experienced at navigating in the mountains using a map and compass, in darkness and bad weather. Competitors may use GPS devices for navigation but must still carry a map and compass (and know how to use them!). Waterproof Harvey maps will be provided and will have the full route marked on them, showing the peaks, mandatory checkpoints and feed stations. The suggested route will have already been plotted on the map for you and you are advised to follow it. You are ultimately responsible for your own route choice however, so you are free to choose an alternative (so long as all peaks are visited in the correct order and you check in at all checkpoints and feed stations). Any areas marked out of bounds must be avoided and uncrossable boundaries must not crossed. Failure to comply will result in disqualification. Competitors may carry their own maps in addition to (not instead of!) the issued one. An example of the 2017 map depicting the different courses (green = short, red = long), Checkpoint numbers, and a Support Point. Most Checkpoints will be un-manned but will have a SPORTident timing control box secured in the location, into which you must “dib” your timing chip to record your visit. Once all competitors have passed through a checkpoint it will be closed down. For safety reasons there will be (fairly generous) cut-off times that competitors have to leave certain checkpoints by. Failure to meet these cut-offs will result in the competitor being switched to the short course or retired. This is a safety measure that has been put in place to ensure that as many competitors as possible cross the finish line, and within the 24 hour time limit. 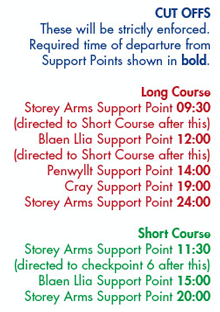 Long course competitors that are having a bad day will also have the opportunity of switching over to the short course at the Blaen Llia Support Point only. This must be notified to the marshals. All long course competitors that switch to the short course during the race will not be eligible for prizes if they happen to be one of the first 3 finishers on the short course, but will still receive the relevant finisher’s medal. These events are very demanding! The short course is not as easy as the name would suggest and we will only allow those with relevant skill and experience to take part. The long course is only for those competitors that have competed in similar challenges, are very experienced in navigation in mountainous environments, in all weathers (and in the dark), and are fit. In previous years, we have had anything from 60% to 100% drop out rates (yes, in 2010 not 1 person finished the Lake District race!) and we urge you to take this as a warning. Participants must follow the Universal Event Rules applicable to all events organised by Kong Adventure. Any Participant who fails to visit all the checkpoints, in the correct order, will be automatically ranked below another competitor who has, regardless of their overall time.